The revolutionize your multi-tasking, Sony has launched two next generation wearable device, the all new Sony SmartWatch 3 and SmartBand Talk. The all new Sony SmartWatch 3 listed on company official website priced at Rs. 19,990 in Silver, Black and Yellow colour option will be available in Classic (Black) and Sport (Lime) editions, with extra colour straps available in Pink and White after launch While Sony SmartBand Talk listed at Rs. 12,990 in Black colour option will be availble in White, with extra vibrant colours later in the year. The all new Sony SmartWatch 3 Android wear is based on three principal as lifelogging, flexible style and intelligent notifications supports waterproof, rated IP68 comes with a 1.6” 320×320 TFT LCD Transflective display beautifully crafted in stainless steel back panel, for a premium look offers visibility in bright sunlight works with Google’s latest Android OS which allows you to receive messages from your friends, appointment notifications, and weather updates at a glance, flight information and many more. Sony SmartWatch 3 can work without connecting to your smartphone with built-in microphone, and Accelerometer, Compass, Gyro and GPS sensor technology means more accurate, more powerful lifelogging. It also comes with a 4GB internal memory which allows you to sync playlists, and simply connect with a Bluetooth headset to listen even your are offline and you can also track that run with GPS and Lifelog. Lifelog is a fun Android app built to enable you to set and achieve goals, bookmark memorable moments, and revisit memories any time, so that you get to know yourself better which can be downlaoded from Google Play Store. SmartBand Talk is waterproof (IP68 rated) Android wear comes with a built-in microphone and speaker with a short call function so you can talk into it and hear your caller, with HD Voice support – perfect for when you’re on the move or your phone is out of reach. Through Sony’s integrated Voice Control technology, you can also assign your own sounds to life bookmarks and use your voice to carry out specific smartphone operations. SmartBand Talk’s curved, always-on 1.4” E-ink display is a fresh creative approach, based on consumer feedback. It’s low-power but highly visible and clear; you can monitor Lifelog activity, view notifications and the time at a glance. SmartBand Talk’s new built-in accelerometer and altimeter sensor technology provide you an accurate overview of your daily physical activity; whether it be walking, running or climbing. You can see how active you were and how you have been communicating, as it pulls all of your information from your smartphone and then enables you to view it on its E-ink display screen, wherever and whenever you like. 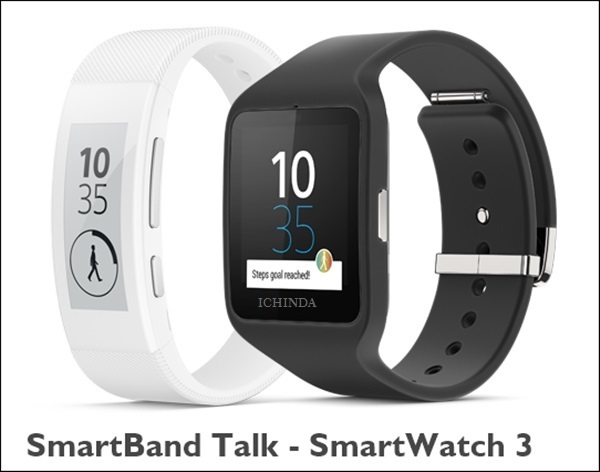 At last I would like to say that the all new Sony SmartBand Talk and SmartWatch 3 wonderfully designed to enhance your multi-tasking.